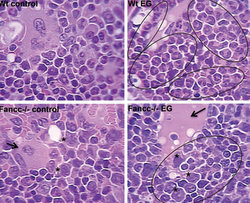 Fanconi anemia is an inherited blood condition caused by a mutation in a cluster of proteins responsible for DNA repair. Northwestern Medicine scientists have discovered a potentially new approach to treating a rare but devastating bone marrow disorder. Fanconi anemia (FA) is an inherited blood condition caused by a mutation in a cluster of proteins responsible for DNA repair. “These patients develop anemia – a decrease in red blood cells – low white blood cell counts and bone marrow failure, usually in late childhood,” said Elizabeth Eklund, MD, professor in Medicine-Hematology/Oncology. The average life expectancy of an individual with the disorder, which occurs once in every 350,000 births, is 20-30 years. Children with Fanconi anemia who do not experience bone marrow failure frequently develop acute myeloid leukemia in adolescence or as young adults. What Liping Hu, a postdoctoral fellow, and others in Dr. Eklund’s lab uncovered is that when mice with the disorder were asked to fight off infectious or inflammatory challenges, the result was an acceleration of bone marrow failure and leukemia. The findings were published in the Journal of Clinical Investigation. From left: Elizabeth Eklund, MD, professor in Medicine-Hematology/Oncology, and postdoctoral fellow Liping Hu recently published an article in the Journal of Clinical Investigation that may change the way Fanconi anemia is treated. Although FA is a blood disorder, it can also affect many of the body’s organs, tissues and systems. Children who inherit FA are at higher risk of birth defects and the disorder increases the chances of cancer and other serious health problems. The work was supported by a research grant from the Fanconi Anemia Research Fund, VA Merit Review and National Institutes of Health grant HL088747.